I thought the racing season was pretty much done now that the rains are here. But there was one more before Halloween. What a fun race too. 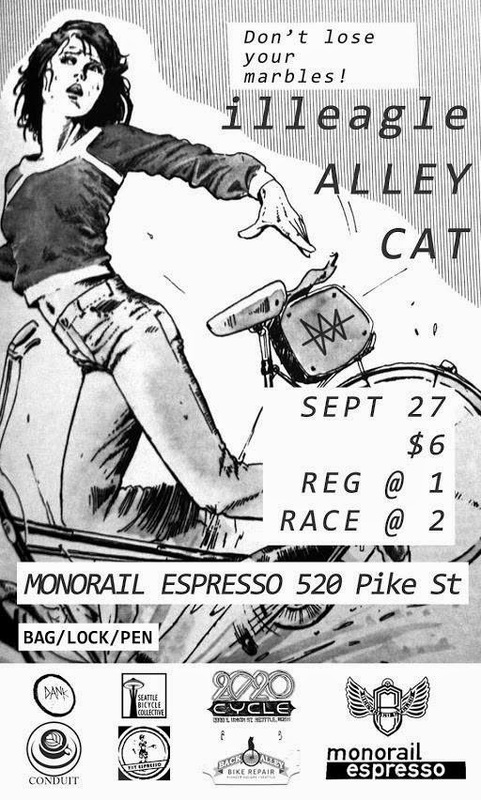 The format was what I have come to think of as the standard alleycat. Meaning, a race with stops in any order. It did come with a twist though. The manifests were not at the start though. Instead we had to pick up the manifests at South Lake Union. Once I got the manifest I picked out my route. There were six stops, I started with Queen Anne. There I did mess up a bit. I didn't realize the stop was on the back side of the hill. It would have been easier going up Dexter, but oh well. Then crossed the Aurora bridge and down into the U-district. Up through the arboretum. Then down to Judkins park along 23rd. (Probably should have used MLK.) Then to the convention center. At the stop on Union I picked sand a Pokemon song and picked up two more checkpoints. I hit Pioneer Square first, then through the Seattle Center. That was a mess on Saturday. The last stop was on Capitol hill so I busted up Denny. That is the straightest/steepest way to get there. If you want to race in Seattle to have to be ready for hills. I then headed to the I-5 colonnade for the finish. In all it took a little over an hour and half. I came in 3 minutes behind the race leader, and for the fourth time this year I took second place. I guess that is just my number. I did come away with a few prizes. I got a t-shirt and some tri-flow. Both of them from Seattle Bicycle Collective. Thanks to JT and the guys who put it on. I had a blast and I am looking forward to the pictures.